Our research lab is composed of faculty and students along the academic continuum of higher education–from the undergraduate level to terminal degree–representing various disciplines, research interests, and research experience. In the spirit of the diversity of interests and experiences represented in the lab, the Counseling Psychology TEAM researchers examine a number of topics, with the aim of shifting paradigms of understanding toward equity and justice. 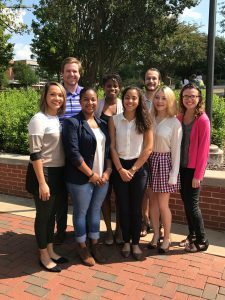 The TEAM lab investigates the ways in which multicultural and diversity characteristics intersect with and impact “established” mental health and behavioral constructs, including health disparities in mental and physical wellness constructs, such as disordered eating and Multiple Sclerosis, psychology trainee competencies, leadership, and other constructs within multicultural studies (broadly defined).